Sea level rise projections just keep getting worse. They’ve gone from about 3 feet by 2100 now to as much as 9 feet. And we don’t have to wait until the end of the century to see the waters rising. Storm surges are higher and sunny day flooding is already happening in places like Miami Beach, as tides push up out of storm drains and sewers. The impact will fall much more heavily on the bottom 90% of income holders. The wealthy will suffer some affordable losses. But what about those who rent, or whose homes hold most of the equity they own? Or people whose jobs depend on their communities not washing away? As we saw after Hurricane Harvey in Houston, they will be out of luck. 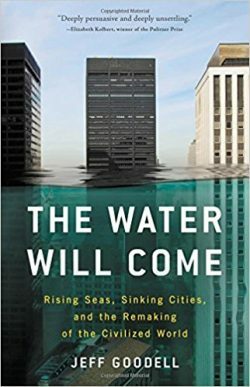 In his book, The Water Will Come, journalist Jeff Goodell describes the toll sea level rise is already taking around the world and lays out sober predictions of its future damages. But he also says there are steps we can take to moderate its impact — stop emitting carbon, for starters. We can also retreat from the coasts and learn to live better with the water. Jeff Goodell writes for Rolling Stone Magazine and is a fellow at the New America Foundation. His previous books include Big Coal and How To Cool The Planet. Web Only Extra: Scientist Robert Kopp talks with WV about his new report doubling official sea level rise predictions by the end of the century. Only 90 companies are responsible for nearly two-thirds of all climate change. How long will it take before the world starts holding them accountable in court? It’s already happening. It might surprise you to know that the vast majority of climate change lawsuits are happening in the US — although the rest of the world is beginning to follow. None have yet been won — but it took a long while before Big Tobacco starting losing big in court and many predict Big Carbon will follow suit. Lawsuits aren’t the only liability. Insurers and ratings firms like Moody’s are demanding that governments and companies take climate change into account or face the consequences. The nonprofit Climate Liability News is the go-to website for reporting on the intersection of climate change impacts and the law. We speak with founding editor Lynn Zinser. Before starting CLN, she was with Inside Climate News, where she worked on the Pulitzer Prize winning report The Road Not Taken on Exxon’s early research on climate change, which the company later abandoned and covered up.